Family run guest accommodation comprising of 8 individual en-suite chalets. Guests have their own front door. A full English Breakfast is served in the breakfast room. The New Inn Motel sometimes limits bookings to 2 or more days. Comfortable and cosy twin with en-suite shower, ground floor room with own private access. No one nights available at weekends & bank holidays. Reduced rates for Children please contact direct. Room 2/Twin sometimes limits bookings to 2 or more days. 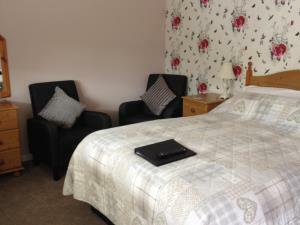 Comfortable and cosy double with en-suite shower, ground floor room with own private access. Room 4/double sometimes limits bookings to 2 or more days. Room 5 /double sometimes limits bookings to 2 or more days. York to Wigginton then Huby.